Imagine walking into an art exhibit that not only is visually appealing, but will also help to feed families within your area. 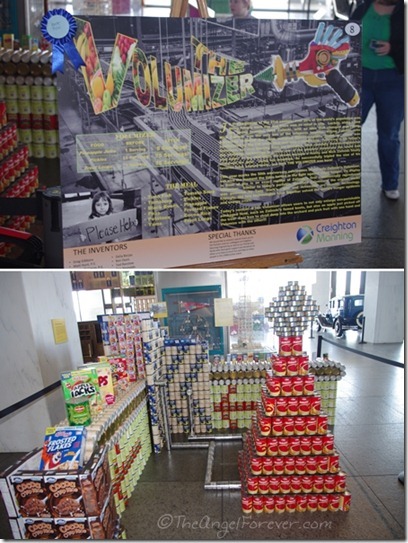 This is the reality of the 3rd Annual Capital Region Canstruction at the New York State Museum. 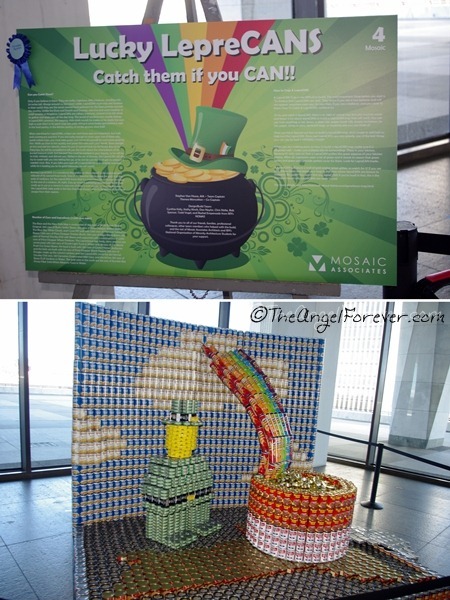 Canstruction is a design competition that has been taking place all over the country. 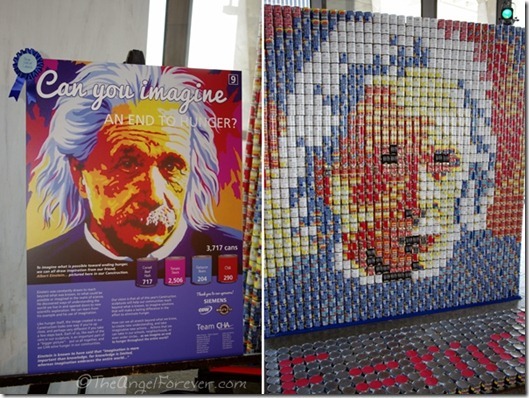 In the Capital Region, local architects, engineers, contractors, and students participate in this event where the goal is to create imaginative art that is simply made of canned goods. The exhibit will be on the 4th Floor of the New York State Museum (free) from March 28 to April 11. Once the exhibit is closed, all of the food will be donated to the Food Pantries of for the Capital District. If you decide to go, please bring some cans with you. 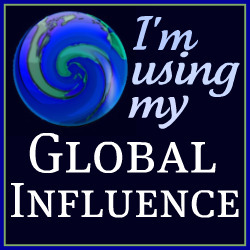 Part of the fun is voting for your favorite structure. Each display has a bin in front of it where you can donate a can as a vote. The one with the most donations will win the Community Choice Award. Let me take you on a tour of the festivities. When you enter the New York State Museum, a display is within the lobby area. 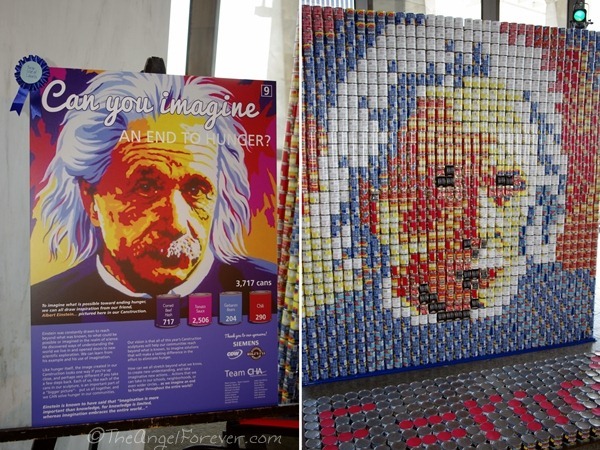 It was made by Tech Valley High students and faculty members and contains 3,814 cans. As you will see, each display has a board explaining the inspiration, who designed it, and what cans are included. This display was the Community Choice Award winner last year. When we went upstairs, we circled around the exhibit. I spent some time sending out Instagram photos, while the boys and TechyDad looked around. Our first stop was In Our Dreams which was made by Price Chopper. 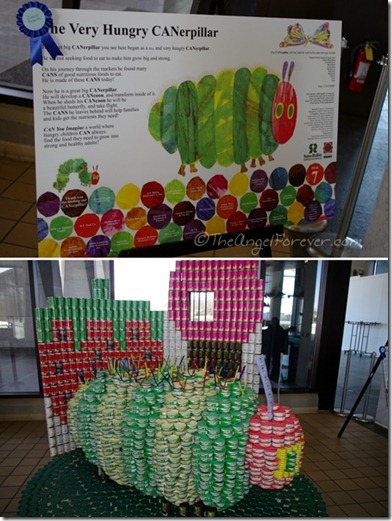 This had 4,000 cans of soup, 200 bottle of white grape juice, 48 cans of chunk light tuna, and 48 cans of albacore tuna. At first glance, we missed that the brain actually lit up. This was a very fun addition to the structure. Thanks to the extra feature, it won JSL’s vote for favorite and a can was placed in the donation bin. From here you could quickly see the focus of the next display. Look carefully for the peace sign. Yes, this display was called CAN You Imagine World Peace? 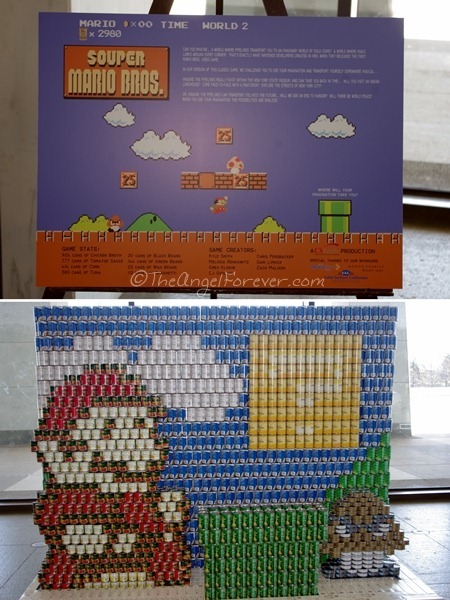 and was made from 5,778 cans of tuna. One of the most colorful displays was next. Lucky LepreCANS – Catch them if you CAN had 7,500 cans. At the bottom of the rainbow and pot of gold is an outline of New York State made with cans. I’ll let you in on a secret – this was almost my favorite. From here, we walked back around to the other side of the 4th floor to check out The Volumizer. This won the “Best Meal” honor and when you look carefully you will probably understand why. Next up are some fun little fellows that you will likely recognize from Despicable Me fame. The Minions are part of the Minion-Mize HUNGER that had 5,450 cans including tuna, macaroni and cheese, instant bouillon, black pepper, cherry gelatin, chocolate pudding, Slim Jims, and roasted coffee. This was also the structure that captured NHL’s vote for favorite. Across the way from the Minions was another very famous critter. Yes, Eric Carle’s Very Hungry Caterpillar was the focus of The Very Hungry CANerpillar. 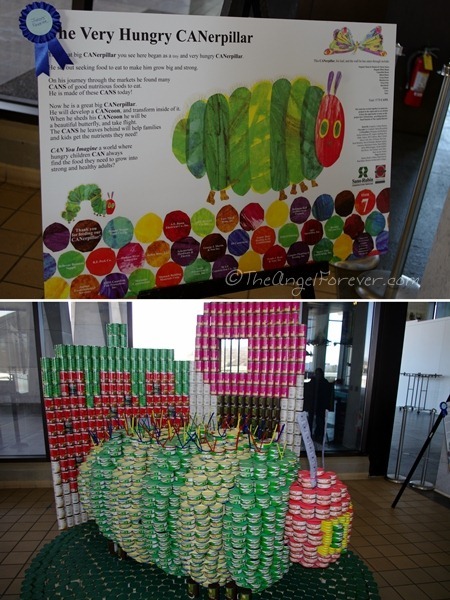 This colorful creature, who stole my heart, was made up of 5,770 cans. As a teacher, the nod to literature and creativity on so many levels won my vote as favorite. Heading back around the corner, we dove into some 8-Bit Mario game nostalgia. The game stats for SOUPER MARIO BROS. was very impressive. It included the following cans: 924 chicken broth, 777 tomato sauce, 414 corn, 380 tuna, 211 black beans, 144 green beans, 20 wax beans, and 110 boxes of spaghetti. I almost think the skillfully hidden question mark for a power up may have been what made it TechyDad’s favorite. As we followed the yellow brick road along the exhibit area, we came to We’re not in CANsas anymore… which won for structural integrity. This fun recreation of Oz is made up of over 3,000 cans of tuna, green beans, dices tomatoes, pink salmon, jello, split peas, and sardines. The last of the structures that we saw won for the best use of labels. When you see this, it is not hard to understand why. Can You Imagine an End to Hunger? features the face of Albert Einstein. When you stand back it blends beautifully together to look like the picture. Also note his famous formula underneath – I missed that when there. 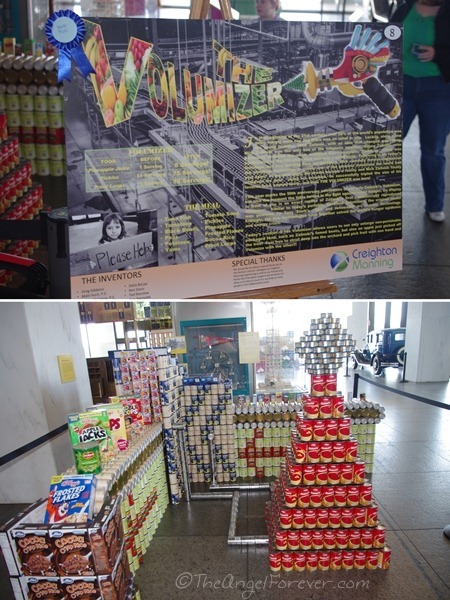 We really did enjoy our visit to the 2013 Capital Region Canstruction exhibit. I know that the boys learned a lot, had fun, and so did we. 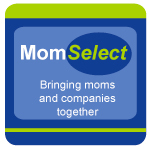 We look forward to going again next year. 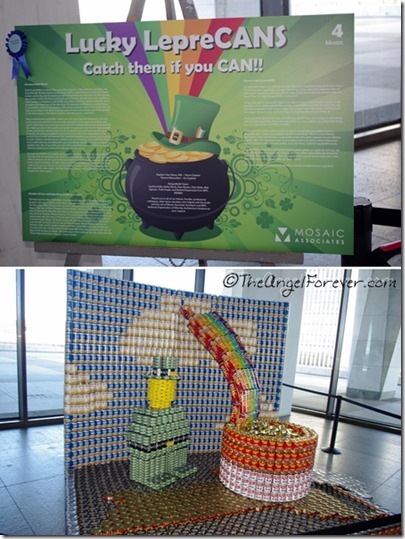 Oh and be sure to look at #Canstruction on Instagram and Twitter because the events all over are fun to check out.